A New Orleans attorney filed a lawsuit Tuesday morning against the NFL and commissioner Roger Goodell, on behalf of New Orleans Saints season ticket holders and its fan base, to compel Goodell to enforce a NFL rule that would allow the result of Sunday’s NFC Championship game to be reversed, replayed in its entirety or from the point of the controversial non-call. The civil suit is the latest fallout since what’s been labelled the "most egregious missed call in the history of football," by ESPN anchor Max Kellerman. The non-call of pass interference on Los Angeles cornerback Nickell Robey-Coleman, after he made contact with Saints wide receiver Tommylee Lewis in the fourth quarter of Sunday’s Saints-Rams game, with 1:45 left to play, has been widely criticized. "That call makes it first and ten, we’re on our knee three plays, and it’s a game changing call," Saints’ head coach Sean Payton said in a post-game press conference. The Rams later went on to win the game in overtime. "This lawsuit is about holding the league and Roger Goodell accountable for the blatant (mis)actions of its employees and maintaining the integrity of the NFL," lawyer Frank J. D’Amico, Jr. wrote in a statement. 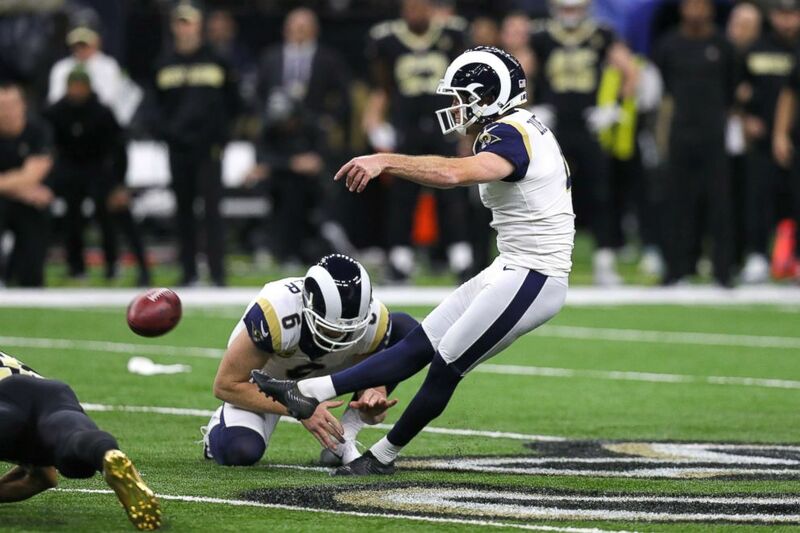 Greg Zuerlein #4 of the Los Angeles Rams celebrates after kicking the game winning field goal in overtime against the New Orleans Saints in the NFC Championship game at the Mercedes-Benz Superdome, Jan. 20, 2019, in New Orleans. The lawsuit is a petition to compel the league and Goodell to "enforce its own rules, specifically Rule 17 Section 2 Article 1 which provides three possible remedies to this egregious situation that occurred in the Superdome on Sunday." According to Rule 17, Section 2, Article 1 of the NFL handbook: "The Commissioner has the sole authority to investigate and take appropriate disciplinary and/or corrective measures if any club action, non-participant interference, or calamity occurs in an NFL game which the Commissioner deems so extraordinarily unfair or outside the accepted tactics encountered in professional football that such action has a major effect on the result of the game." Article 3 goes on to list the commissioner’s powers which include "...the reversal of a game’s result or the rescheduling of a game, either from the beginning or from the point at which the extraordinary act occurred." However the rule also states: "The Commissioner will not apply authority in cases of complaints by clubs concerning judgmental errors or routine errors of omission by game officials. Games involving such complaints will continue to stand as completed." Criticisms of the non-call have been bolstered by Robey-Coleman’s own admission, in a post-game locker room interview, that he believed he committed the penalty and thanked the referees for the non-call. Payton told reporters he had spoken with the league office moments after the game ended and said they admitted the officials blew the call. "I don't know if there was ever more obvious pass interference," he said in the press conference. "That is a hollow apology when they take no power to correct it when the commissioner has power to adjust it," D’Amico told ABC News in a phone interview. "The commissioner has the power to either reverse the results of the game, reschedule the game in its entirety, or from when the extraordinarily unfair act occurred... turn back time to the spot of the penalty that wasn’t called, put the teams back on the field, put 1:49 back on the clock and let the game proceed with a first down and the Saints having one timeout." D’Amico told ABC News he believes the game had a grossly unfair result. "It’s unheard of when you have three officials staring it down, and wave it down and say we’re not going to do anything about it," D’Amico said about the missed call. 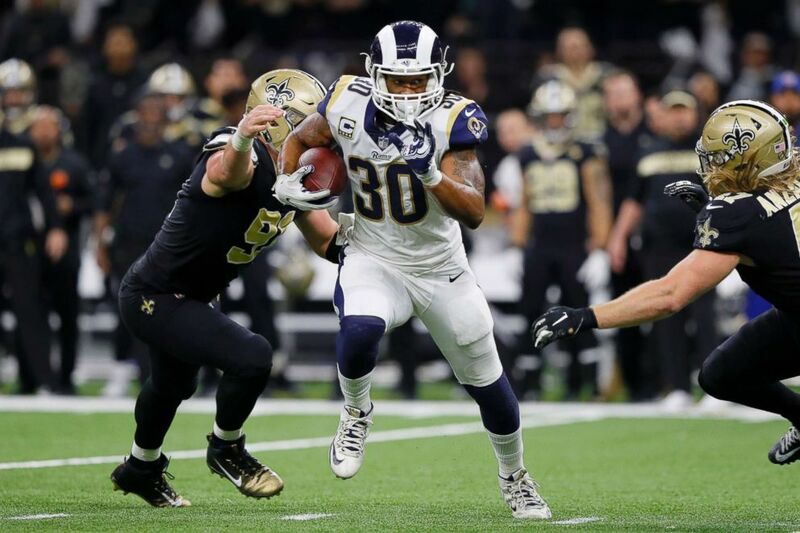 Todd Gurley #30 of the Los Angeles Rams runs the ball against the New Orleans Saints during the fourth quarter in the NFC Championship game at the Mercedes-Benz Superdome, Jan. 20, 2019, in New Orleans. D’Amico called it a "national embarrassment" and alleged the NFL is perpetrating fraud to the public, leaving fans with "no faith in the NFL for fairness despite the leagues own rules to correct such errors." The NFL did not return ABC News' request for comment on the lawsuit. New Orleans Saints owner Gayle Benson told ABC News the team has "...been in touch with NFL and will aggressively pursue changes in NFL policies to ensure no team and fan base is ever put in a similar position again." While D’Amico said he is not looking for any money damages, he is hoping for Goodell to answer “why he’s not following the rules.” A hearing is scheduled for next Monday morning in Orleans Parish Civil Court, according to D’Amico.